I know three posts in one day, so I should be good for a month right? I attempted to take a picture of our newly extended clothesline and my soap making supplies. Truth be known I am not a cheap person. I never have racked up massive debt, but let's put it this way. I have a taste for quality. But since going more natural I wanted a simplified laundry detergent without all the chemical additives. 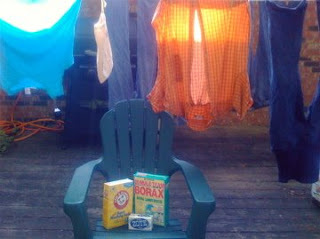 This recipe is 3 ingredients: a bar of laundry soap (zote is my personal choice), borax, and washing soda (not baking). The Zote I buy at Brookshires, and the borax and washing soda come from Kroger. If you are interested in making your own laundry soap here's a great resource: http://www.soapsgonebuy.com/category_s/24.htm. I do have people ask me about this since most people don't make their own cleaning supplies. I make the powdered version because of my tendency to make messes in general. The worst part is grating the soap. Thankfully the weather is nice here this week so I sat outside on the porch grated away while watching a really corny 80's movie on my laptop. Now I know that there are many busy people out there who don't have time for this. Please don't feel guilty for buying laundry detergent. This is just a way that I can save my family money and since I contribute no actual income to the family it is important that I find these money saving opportunities. I absolutely love my clothesline, it makes me feel like I'm harnessing some of our natural resources (lots of heat in Mississippi) and saving $ at the same time. But the line was too short so after consulting with my handy husband he instructed me on how to double it's length. A drill and a screw in hook later we have enough clothesline to dry an entire load at once. I make my own laundry soap, too. And I love it. I usually used Fels-Naptha instead of Zote. And we use a clothesline all summer (and some of the fall). Just one comment about something I've learned over the past few years. Don't use Zote with cloth diapers. Any soap with brighteners or perfumes is a bad idea with diapers. It builds up on them and causes them to not absorb as well. You might be able to find a natural soap to use instead of the Zote. I usually have just washed my diapers separately using Purex Free and Clear or a more expensive natural detergent. I only used it for the diapers, so we still saved money by using my soap on everything else. You won't notice the problem with the diapers at first, but over several months, you might notice that they don't absorb as well and they have sort of a film on them. I know that problem has happened to several friends. I'm so happy to see other people making detergent. It's so easy and works so well! And I make my own dishwasher detergent. Also easy and cheap. How much does your recipe make and how much does it end up costing (like comparatively to cheap folks like me that only buy off-brand or store brand stuff...)? I have seen several detergent recipes online and though it looks simple, I am unsure as to the actual financial benefit. And yeah, yeah, I wanna' be all groovy and shaving a bar o' laundry stuff (who even knew they sold such??? ).